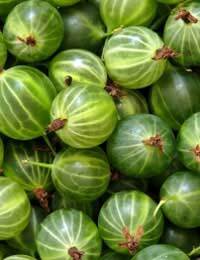 Gooseberries are a very ‘British’ fruit and feature in a number of traditional dishes. We've included a recipe for gooseberry fool, a dessert that's been a favourite in British cooking for centuries. You’re most likely to find green gooseberries in the shops but look out for the red or golden dessert varieties that appear later in the season. These can be eaten raw and should have a grape-like firmness. Because the tartness of the green gooseberries will vary, you may need to adjust the quantity of sugar you use to suit your taste. Wash, top and tail the gooseberries using scissors, and place half in an ovenproof dish. Sprinkle over 2 tablespoons caster sugar and top with the remaining gooseberries. Sieve the flour into a bowl and add the margarine. Rub in with your fingertips until you have a breadcrumb-like mixture then stir in the sugar. Tip the crumble over the fruit, covering evenly. Bake for about 40-45 minutes. Serve hot with ice cream or cold with custard. Wash, top and tail the gooseberries. Place in an ovenproof dish with a tightly-fitting cover and cook in the oven until soft. Press the fruit through a sieve into a bowl. Stir in the sugar. Taste and add more sugar if necessary. Leave to cool completely.Whip the cream until its consistency is similar to that of the puree. Fold the cream and puree together and pour into a glass serving dish. Gooseberry sauce is traditionally served with mackerel, its sharpness cutting through the oiliness of the fish. Wash, top and tail the gooseberries and place in a saucepan with the water and butter. Cover and cook very gently until the gooseberries are perfectly soft. Press the fruit through a sieve and return the puree to the pan. Add the sugar and cook gently, stirring until the sugar has dissolved. Put a clean saucer in the fridge to chill. Wash, top and tail the gooseberries and place in a large pan with the water. Bring to the boil and simmer for about 20 – 30 minutes until the skins are quite soft. While they’re simmering mash gently to break the skins to allow the juices out.Add the sugar and stir over a low heat until dissolved then bring to the boil and boil briskly for about 10 minutes. Don’t let the mixture boil until the sugar has dissolved or the jam may crystallise in the jars. Test for a set. Remove the pan from the heat. Using a teaspoon, put a few drops of jam onto a very cold saucer. Leave it to cool and push gently with your fingertip. If it wrinkles, then setting point has been reached. If it doesn’t return the pan to the heat and continue boiling and check again at 5-minute intervals. When at setting point, draw off the heat, leave for 2 minutes and then skim off any scum. Ladle the jam into warm sterilised jars and cover with waxed paper circles. Cover the jars with a clean t-towel and leave to cool completely. Cover with lids or transparent cellophane covers. Label and store. It’s necessary to use a large pan as the boiling jam will froth up. The skins stop softening when you add the sugar so make sure they’re perfectly soft before you do so. If you have a jam thermometer, setting point will be between 103oC and 104oC. Going to make the gooseberry jam. Last time I made a gooseberry jam it didn't turn out, it didn't set properly, but this recipe looks nicer. I'll get my thermometer ready this time!